Dr. Wike completed is undergraduate degree in Chemistry and Psychology at UNC-Chapel Hill. He finished his graduate work at Auburn University and was awarded a Master of Business Administration. Dr. Wike attended medical school at the Uniform Services University of Health Sciences and was conferred a Doctor of Medicine in 1996. He completed his Internship and Residency training in Family Practice at the Naval Hospital in Jacksonville, Florida. 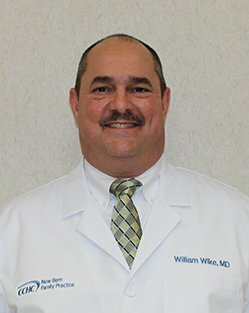 Dr. Wike is a retired Navy Captain with thirty years of honorable service. He is board certified in family medicine and joined CCHC New Bern Family Practice in October 2014. Dr. Wike is accepting new patients.